My older sister Sylvie is a middle-and high-school librarian in inner city DC. It’s a tough area to grow up in, and she has made her library into a safe space for her students. In her first year alone, circulation was up 40%, and her students know they can always go to her for guidance on how to research a paper, use reference materials, and, most importantly, she provides just the right book. She’s made reading fun. “God’s work,” my friend Elissa once quipped in trying to explain to someone what Syl does. It really was Syl’s destiny to be a librarian for teenagers, but this wasn’t her first career. She used to cook. I mean, she still does, but cooking was much more a profession for her than it is for me. People would pay her money for her food back when she lived in Boston nearly 20 years ago — in Allston, as a matter of fact. And she, too, rode her bike everywhere. I think she would have continued working in professional kitchens as long as she could, but just as I’ve done a number on my back with a herniated disc that has slowed down my cooking, she did a number on her front: double hernias. Those professional-sized pots are very heavy, and that’s without them being filled with gallons of soup. The dish I have for today is a Sylvie dish. I asked her earlier this week how she came up with it, but like I said, 20 years is a long time ago. This is actually not the first time I’ve written up this dish: I was a food writer for my college newspaper (surprise, surprise) and our editor once did a spread on the food writer’s favorite dishes. This was mine. This is a pantry dish, and it uses a box of Near East rice pilaf. Before you get all huffy and start accusing me of pulling a Sandra Lee, if you’ve ever had the stuff, I think it’s safe to say it’s a really fantastic side dish. All supermarkets seem to have sales on Near East products every few months. When the Star Market around the corner marks it down to $0.88 a box, I usually buy five or six and store them in the pantry. And even though portobello mushrooms can be expensive, Market Basket always has a good price on them, and I’ve walked away with 3 pounds worth from Haymarket with spending just a dollar. Although there is technically a lot of vinegar and garlic in the dish, the added sugar cuts it all down into something sweet that matches perfectly with the pilaf. This is one of Rich’s favorite dishes, and last week he learned how to make it. Like I’ve mentioned, the herniated disc has really slowed me down, but Rich has been an absolute godsend in making sure there is food on the table and clean clothes on our backs. Last week, when he was prepping and slicing the mushrooms, he came to me with a panicked look on his face because one of the mushrooms he cut had a magenta streak down its side. I asked if he possibly used the same knife he used to dice a beet the night before. He walked away a little sheepishly, but I have to admit I thought that was absolutely adorable. I had forgotten that there had been a typo in the recipe. Well, not the actual recipe, but the byline. The paper has me down as my middle name, Miranda, which seems so much more exotic and exciting than my first name. This dish can work as a main dish for three people with a small salad, or be a side dish for five or six, depending on how hungry your crowd is. And one last thing: If you could ask the governor’s executive director of his PAC four questions, what would they be? How about four questions for the founder of the Boston’s first Jewish rugby team? Turns out it’s the same fellow. Here are mine. Prepare rice pilaf according to directions on the box. 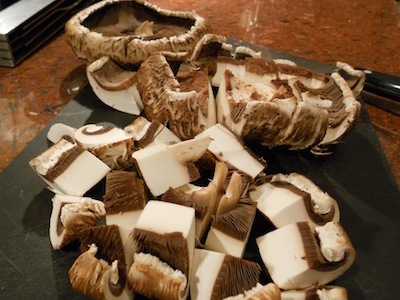 While the garlic is cooking, clean and cut the mushroom caps into bigger than bite-sized pieces. Toss mushrooms into pan and watch carefully. When they begin to sweat – the meat will become pink – add balsamic vinegar. 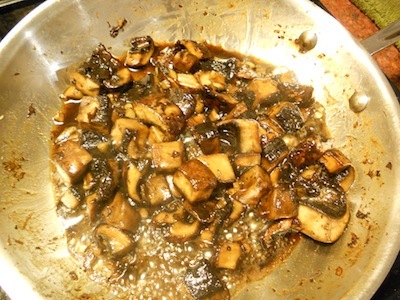 When the mushrooms, garlic and vinegar begin to sizzle, add sugar and reduce heat. Cook on reduced flame until mixture turns syrup-like (about seven minutes). Add a dash of salt and pepper to taste. Remove dish from heat and mix in the rice pilaf. incredibly, I’ve never had this amazing sounding dish… yet. but i may very well try it this week or next when I make it myself. We need to get Rich an apron that says “sous chef” on it. I thought your other sister was in DC, or maybe they both are? We buy huge quantities of that Finnish Ryvita crisp or whatever it’s called. The ingredients are all normal things anyone would have in their pantry (maybe not rye flour, though I do)–so no judgment on the near east. I wish you had shown us a tablescape thought. Sara, Both of my sisters are in DC. They live about 40 minutes from each other. I’m pretty jealous of that, and oftentimes have fantasies about moving down there so we can all be together. Also, ha! Tablescape. When I do have a tablescape — which happens more and more the older I get — its usually for a Shabbos dinner. I always post it to Facebook. When did I turn into my mother? Thanks for the shout-out to school librarians, and for making it easier for me to share the recipe when people ask (and they do, whenever I serve it to company!) Now I can give them the link. Hope your readers enjoy this as much as we do. I’ve also enjoyed making sandwiches with the caramelized-balsamic mushrooms on a baguette with arugula and goat cheese. Yum! 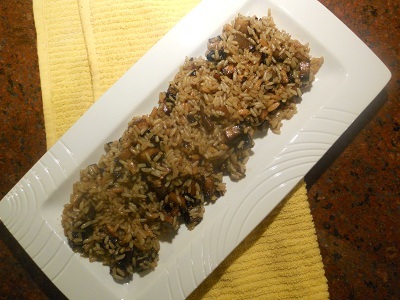 love mushrooms and I make the pilaf with rice or Israeli couscous. Comforting and delicious! oooh I’m loving all the great flavors in this!